With oilfield growth often comes economic expansion and building of commercial centers and new residential areas. 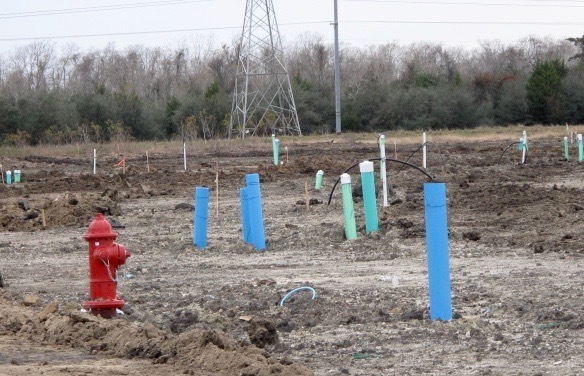 Real estate developers are discovering abandoned and unknown “alien” pipelines on their properties at an increasing rate.In some cases, you can find the alien pipeline documented in state or federal regulatory reports or local courthouse title searches. Oftentimes, however, they do not exist as far as public records. 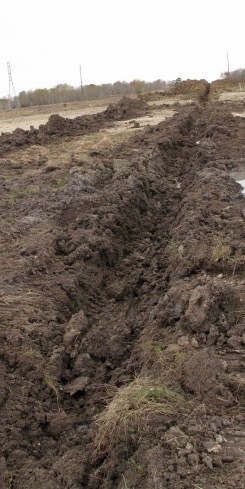 The discovery of alien pipelines happens mostly at the onset of infrastructure installation (streets, water, sewage, and utilities)for new residential or commercial projects.Existing pipelines have been flagged and identified by their owners, and the developer is ready to proceed with excavation of these lines. When the alien pipeline is discovered, work comes to a halt. The alien line seems to come from nowhere and seems to go nowhere, but it does cross the subject property for a few hundred or maybe a few thousand linear feet. Nothing else is known. No one claims the pipeline, and the label “abandoned pipeline” is quickly applied. Most developers think that because a pipeline is abandoned, then they can proceed with excavation. In everyday terms, “abandoned” means to have walked away from, but to a pipeline owner or regulator, the term only means the operator/owner is not using it at the time. The ownership remains intact; therefore, before excavating an abandoned pipeline, every effort must be made to determine ownership. Proceeding without doing so could be a violation of an easement agreement or risking trespass on someone else’s property. Additionally, for the safety of the excavation crew, every effort must be made to determine what was transported in the abandoned pipeline. Removal of an abandoned pipeline could risk the health safety of the excavation crew. 1.) Lease lines. These are often small diameter gathering pipelines and not dedicated lines that would require a documented easement or corridor designation that would justify a recorded easement and contract. Most gathering lines or lease lines are laid from well to tank, tank to trunk line, well to line, etc. These lines are temporary in nature, and sometimes even laid on the surface for the purpose at hand. If situated on the same lease as dedicated lines, lease lines do not require a dedicated easement to be officially documented. Additionally, if all lines are on the same lease, no record is required in most oilfield states. This makes tracking down the owner and determining the type of line almost impossible. 2. )Asbestos Coating.Vintage lines laid prior to 1980 have varying amounts of asbestos (usually Chrysotile) fibers embedded the exterior coating. This protective coating insulated the underground pipe. The asbestos fibers are stable and non-hazardous as long as they remain non-friable(bonded) and buried. The asbestos only becomes friable when it has either disintegrated or has become dry and soft enough that it can be crushed into powder form with only normal hand pressure. 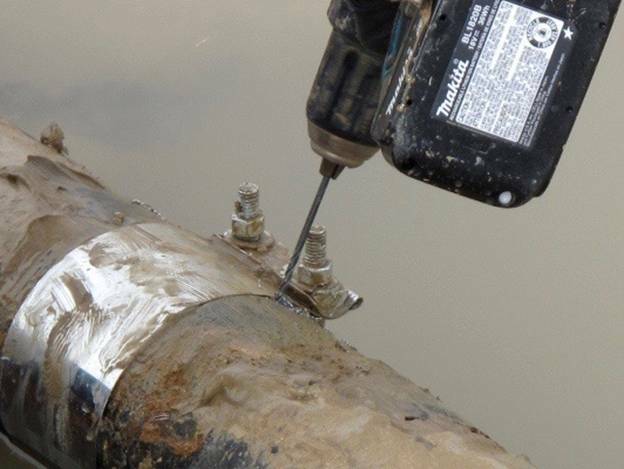 Whatever the state of the asbestos coating, licensed and certified contractors are required to be onsite to supervise the take-up (removal) asbestos-coated pipelines.Generally, the normal take-up procedure usually requires that the pipe to be cut at some point. The abrasion of the cut increases the possibility of friable asbestos becoming a potential issue. This is why the EPA and OSHA require licensed and certified contractor and on-site supervisors. 3.) Residue.There is always the possibility of product residue in these lines. Cuts or taps into the line can determine the presence of residue of oil and gas products such ascrude, water, air, and nitrogen. Exposure of product residue and its flammability need to be considered when removing the pipeline. We have found flammable residue in 25% percent of all of the approximately 20 million feet of pipelines we have removed in the past 31 years (1986-2017). 4. )Ownership.There is limited to no knowledge of the owner (current or past) of the pipeline in question, thus the alien status. Aside from determining lease or gathering lines from crude or gas transmission lines, there have been large numbers of mergers of oil and gas companies, pipeline companies, and bankruptcies or just businesses going defunct and closing down over the past few years. Many non-performing or unobtrusive underused pipelines can be forgotten if uneconomic, not to mention the pirating of a line by another operator who needs a portion of the pipe for their own transport needs. We really don’t know what is going on beneath the surface with pipelines a lot of the time. We get plenty of calls from the Houston area and occasionally calls from Michigan, Pennsylvania, Oklahoma, and California as well seeking help in identifying alien and abandoned pipelines. However, many developers just call a construction company or use the one they already have on-site to remove the alien pipeline. These workers are all at risk from possible fire, toxic release, and hazardous waste exposure. It is important to immediately call an environmental specialist or consultant to check and inspect any alien pipeline discovered on a property. I know of no standard dirt or street contractors that could determine the type of coating on petroleum pipelines for possible asbestos exposure. If you as a contractor or your subcontractor uncovers a strange or alien pipeline, follow the following steps to ensure that you can remove the line safely. Identify pipeline characteristics such as size, material, length, and coating type. To identify the coating type, you can either call an environmental consultant to come take a sample of the coating or take a sample yourself (using a facial respirator and dampening the sample area to be sliced). Place the coating sample in a plastic bag, seal the bag, and send the sample to a lab for asbestos testing.Write your name and address on the plastic bag, and get delivery confirmation when you send the sample to the lab.At J‑3 Resources in Houston, TX, you can get your sample tested for asbestos for under $50, andyou can get the results in a day. Determine Ownership. Go to the courthouse to search courthouse records. You can also hire an IRWA (International Right of Way Association) member or petroleum landman to do this for you. These people will research records to ascertain ownership by following the chain of ownership through the easements sections or right of way sections of the district clerk office. Often these avenues are overlooked by general title search personnel. If you can find the rightful owner of the existing pipeline, you can negotiate for removal or exchange of ownership so you can do something about removal for your project. 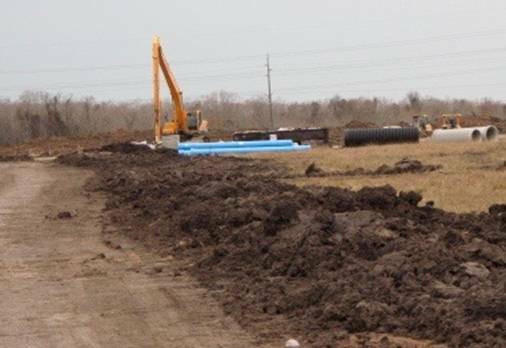 Do an online search for pipeline environmental consultants in your area to find out about pipeline removal. It would help it they had EPA or OSHA approval along with their credits. HOW TO DETERMINE RESIDUE PRESENCE/INTERNAL HAZARDOUS MATERIAL. Once you have ownership and ascertain the condition of the pipe, residue presence, presence of hazardous or potential hazardous material externally or internally residing in the pipe, you can have a certified contractor proceed with deconstruction or removal of the line in question. When you contact removal specialists for a toxic line, make sure they are certified in handling toxic substances such as asbestos. Natec of Texas is a training company in Houston that offers seminars and classes to train, license, and certify workers, contractors, and supervisors in asbestos work. They can provide training for your personnel and or recommend a contractor who can do the work. They can also recommend other training facilities throughout the United States. If you have done due diligence to locate the owner and still cannot determine ownership, you might need to take more daring moves and find someone who is willing to step out into this unknown world and tap the line for pressure with a non-sparking drill or bronze punch. Residential infrastructure in place over 1940’s vintage oil field with the underlying presence of undocumented lease and gathering lines. Sewage and water lines being installed uncovers undocumented line. Trained operator attempts to determine pressure or residue in gathering line. Ultimate precautions are taken to ensure no releases or fires result from discovery. Surrounding infrastructure is completed while waiting for alien lines to be removed in other parts of the development.